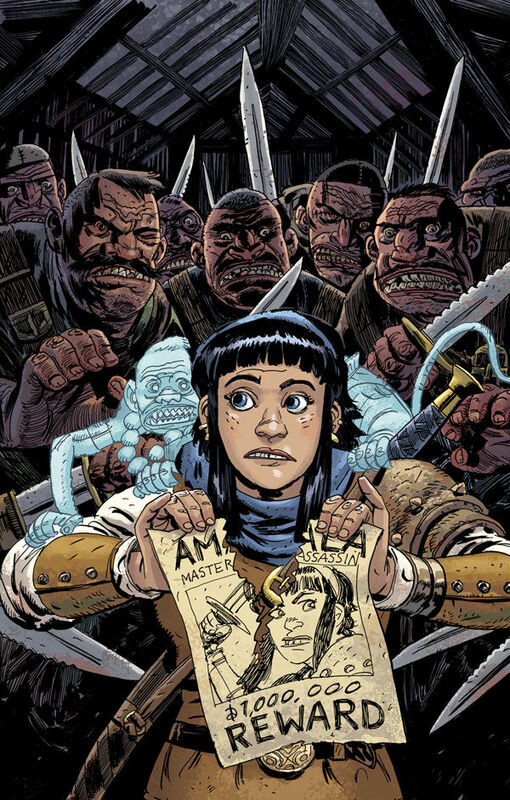 The Fellowship was fortunate enough to obtain a copy of AMALA’S BLADE #1 from Dark Horse Comics. The story and lettering is by Steve Horton, with art and colors by Michael Dialynas. Amala is the best assassin in Naamaron, but she’s also a wanted woman. After completing her latest assignment she goes home. Meanwhile, the Vizier and Magister plot what they hope will be her final job while watching battles in the arena. Amala's next job is to kill Strawbale, a noblewoman that lives in Purifier capital of Ouon. Amala asks for assistance from Ren and Smitty to come up with a plan knowing that something else is going on. She takes off on her mission, but will she survive it? This is a fun little story here with an intriguing world that is sword and sorcery with a little sci-fi technology mixed in for good measure. Steve Horton has written a tale that is unique, with enough action to keep you interested. Horton doesn’t go the stereotypical route with the female assassin and creates a refreshingly different character. Michael Dialynas’ style is just as different, but very beautiful and expressive. I hope that there will be more adventures beyond this four issue mini-series, because I like what I’ve read so far. AMALA’S BLADE #1 is in stores now or available at www.darkhorse.com.